Acrylics Anonymous, Issue #005 -- Get your rocks on people! This month's Sealed Section is a special treat. A short video - raw footage of Mark in the studio, at the coal face, showing you his process of painting rocks. Brought to you in portrait format as only a smart phone can (hence the black strips either side), this video is the first in our ongoing series of "Over The Shoulder" clips. (Next time we will shoot it in landscape format methinks). Make sure you subscribe to our Youtube channel for ongoing access to this series. 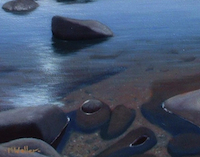 The secret to painting semi-submerged rocks convincingly lies in your observational skills. I have one word for you - reflection. 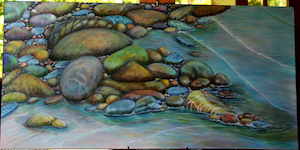 Wet rocks will reflect lots of light (try and say that 10 times quickly!). Dry rocks less. (Now say THAT 10 times quickly). The surface of the water reflects light a certain way. Wet rocks reflect light a different way. Notice the difference. Now paint it! Rock On!….Paint your rocks in a whole new way. Setting up Your Workspace. Smarter. Learn how to set up your space so you can get into your zone quickly, freeing your mind from the background clutter. Our new 22 page downloadable e-booklet is available now! Payment is via donation (min AUD$2.50 - we need coffee as much as you do)! We came across Karl Haglund one day while surfing the net and was immediately taken with his "Welcome. This is what I look like:" image of himself next to a giant gorilla (appealed to our funny bones here at AA!). He creates iconic guitar paintings, cityscapes and abstract expressionist paintings in a loose, vibrant and immediately compelling way. Check out Karl's site right here. In keeping with our rock theme this month, this image of Ron Schwartz's was immediately engaging due to it's stark lines and sense of the bigness that is our planet. (Click on the link below). I kept clicking and found some more rock paintings from Ron which are fabulous. A highlight (pardon the pun) for me was the painting "Bouncing Light". 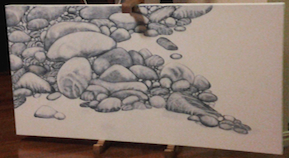 Check out Ron's Maine Rocks painting here. July's feature painter is June Hunter, who came to our attention via the "contact us" form in this very ezine! She writes: "My name is June Hunter and I love Acrylics. I have been a scribbler all my life but never had the chance to paint until retirement a few years ago. I'm currently experimenting with rocks painted in the style of Elizabeth Tyler, along with water and waves as inspired by Mark. It's teaching me a lot about using glazes and the effects that can be achieved. My painting isn't finished as yet but I'm having a hell of a lot of fun splashing paint around again!" Thanks so much for sharing June. We noticed you didn't take us up on our free recipe card last month (either that or I can't read our statistics properly. Hmmm, that could well be the case! ).